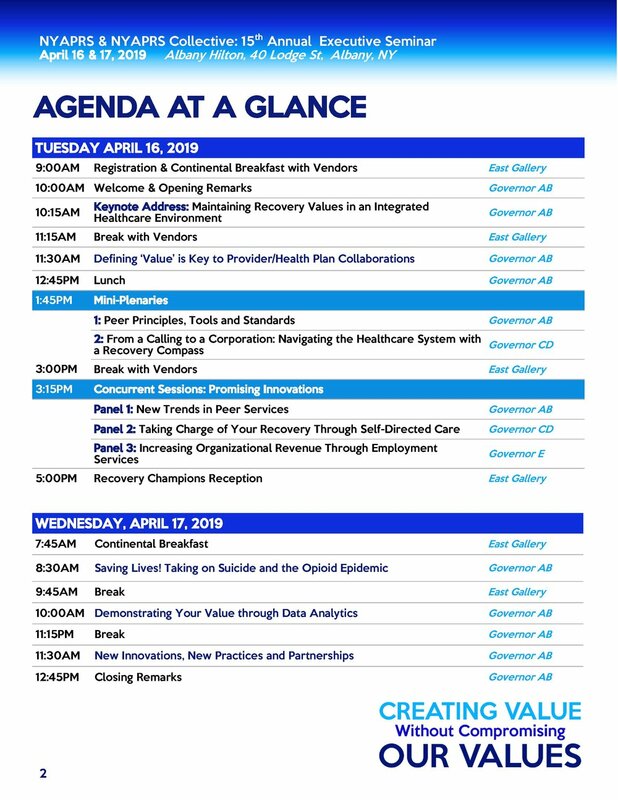 NYAPRS Note: We’re only 1 week out from this year’s NYAPRS Executive Seminar program, entitled “Creating Value Without Compromising Our Values,” to be held on April 16-17 at the Albany Hilton! Please see our Final program attached and below. IIn keeping with the Seminar’s tradition to take a probing look at the issues of the day, our Wednesday morning program will lead off with a power discussion, entitled “Saving Lives! Taking on Suicide and the Opioid Epidemic,” that will take a deep and frank look into why suicide and drug overdoses have each reached epidemic proportions, and point to a number of innovative national and state initiatives that are helping thousands to reconnect with their recovery and purpose, to overcome obstacles to adequate access and treatment and to help save each other's lives. · Antoine Craigwell, Founder, President and CEO, DBGM, Inc.